Is a good deal emaciated. Rx: Liq. Ammon/Acet [?] every 3 hours. Anooqne (?) h.s. if required. “his disease originated in the line of duty. Treatment Kng (?) Ayos (?) Sitres(?). “Syphilis, There is no evidence that his disease originated in line of duty. the necessary change may be made. 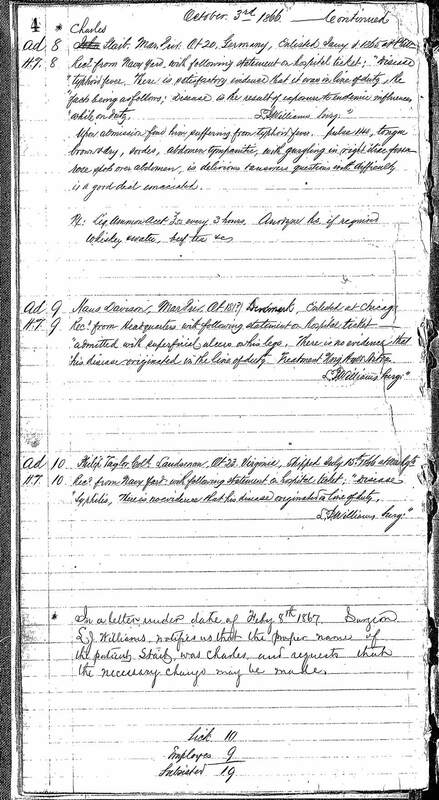 NOTE: These are digitized copies of the original records of the patients admitted and treated at the Naval Hospital, Washington DC, from 1866 to 1906, held by the National Archives in "Record Group 52, logs of hospitals, 1861-1875 (11W3 3-29-D)"